I might have misheard, but in ep #3 of his Regen Rovers series, GoldenFM said that the 'encourage' shout no longer seemed to work for him. I'll have a skim through again and see if I can find it, there was definitely one that he said didn't work as in previous FMs. I have had a positive reaction to "Encourage." I used it when we were underdogs in a part of the game where we were getting steamrolled, but hadn't conceded yet. I think that's the only time I've had a green reaction to it. Yeah, I'm having some quibbles with the shouts as well. I don't know if it's a function of it being a LLM game, but I tell my players "Concentrate" and they all immediately poop themselves. A bit annoying. This may also be because my team thus far has been wholly unable to concentrate for all 90 minutes of a game. I bring off my best player (an aging veteran who can barely play 90 minutes and cannot train due to a recurring injury), and immediately ship AT LEAST one or two goals. Keee-rist. We're doing okay, but we cannot hold a lead because my two best CBs have a combined pace of 7. We recently went up 3-1 against Chelmsford, they switched to a 4-4-2, and just started pumping it long, leaving it for our elderly CBs to try to chase. They couldn't, and we ended up drawing 3-3. Oh, AND we should've won. We had 6 clear-cut chances and 6 half chances, they had 1 CC and one HC. And we drew. Goodness gracious how I'd missed LLM. Ewww, PREDERICK. I was eating my breakfast, for heaven's sake. ...I've played a lot of FM, but I have spent WAY too much time in the Big 5 leagues. It's time for a challenge that doesn't immediately end in promotion to one of the glamour leagues. So I'm really going to set out my stall for something different. Here we come, Belgian lower leagues! Cool! Let me know which team you picked! I managed (just) to win the Scottish Premiership with Celtic...courtesy of an 86th minute equaliser in the final game. I'm hoping that it's a reflection on Celtic's side being worse more than me being worse, but Rangers are noticeably better, and I had no one with the every match ability of Patrick Roberts. I somehow managed to prise Kasper Dolberg out of Ajax (spent most of the £32m Man City paid for Kieran Tierney, plus Tom Rogic), but he veered from the sublime to the ridiculous...three games of 6.4 or below at the end of the season just ain't cutting it, mate. This has led to an approach from Athletico Madrid (Diego Simeone has gone to Man City...which might lead to some awkward conversations around the dinner table, considering that AM beat City in the CL final, 2-1(AET). Do I make a go at AM, or see how I can improve Celtic over the summer - I got us out of the CL groups last time, but promptly got steamrollered by FC Arrogant, who then proceeded to tap up one of my best players, so no change there then. One of my favourite FM games involved starting in the Slovenian 2nd division. It’s definitely worth trying something like what you’re doing, when you end up with a big job in a few seasons it makes a real great feeling. Yeah, I've played in the League Cup enough times, I want to try something different. I also have had the goal of trying to win the Europa/Champions League with a team that's not from the Big 5 nations, but never sat down and really went after it. Perhaps this time? Maybe try with Ajax or Porto/Benfica ? I might have a dip into the Russian league next, or try the mega complicated Brazilian lower league that someone mentioned in the FM18 thread. Heh, well, I, in my insanity, also wanted to try and win it from a club/nation that's never won it before. I'm finding the "demand more" shout to be extremely effective, almost to the point where I question if its a bug in the game. So many times I've used it, and minutes later the team scores a goal. I've also, for the first time ever, successfully deployed a target man this year on FM. I've never been able to use them effectively, but so far my lone man up top, Simon Ainge, has almost 25 goals. I’d like to add a functional “demand more” feature to our family. The one we’re using now has no effect on our teenage kids. Yeah, the shouts need a few tweaks, because "Demand More" works GREAT but "Encourage" causes all of my players to throw a hissy fit. 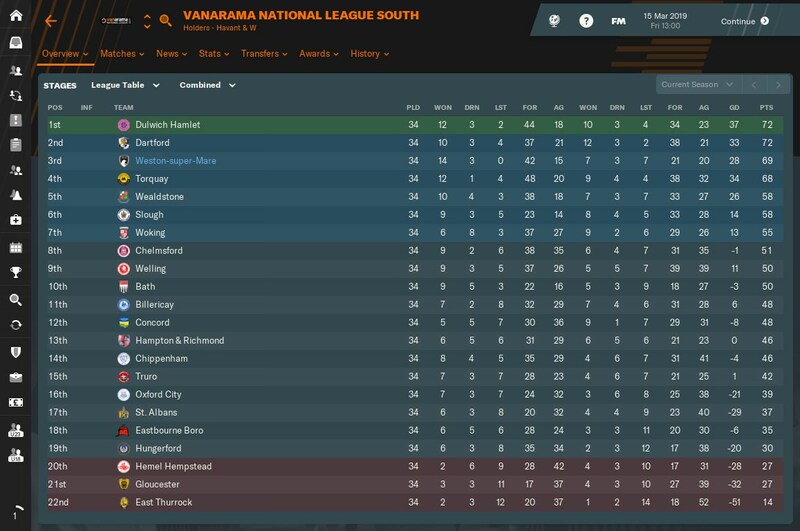 My game is going weirdly well, considering Weston Super Mare were picked to finish about 18th before the season. We move back and forth between a 4-2-4 and a 4-3-2-1 depending on opposition and the condition of my key players. The 4-2-4 puts two cautious midfielders in front of a mostly defensive back four, tries to win the ball back in front of our own area and then ping sixty yard passes to a front four told to stay high up front. The 4-3-2-1 presses a lot further up, tries to win the ball off the back line or defensive midfielders and score before they can react. Keeping everyone fit has been the hardest part so far because we're semi-pro and a 42 game season plus the FA Cup and FA Trophy really stretches the small squad we have. I haven't found the shouts to be over-powered yet and "Encourage" is working fine for me if I'm judicious about where I use it. Mostly when I'm away from home when the opponents are the favourites and we're clearly second best "Encourage" seems to bring positive reactions. Nice home record, Mr. Bismark, looking good! Maybe you should transfer list them. Tell them they might find out in person whether they can play on a cold, wet Tuesday in Stoke. Lolz. Good idea. I like it. Then we could look for free agents with higher work rate attributes. Look up Stoke-on-Trent on the interwebs and show them pictures. If that doesn't have them working like Stakhanovites, then nothing will. "See those deserted potteries and empty factories - you could be there, living the dream". "Son, I'm sending you on Loan to Vitesse." 10 games into my new game in Belgium, and the Premier League's Top 6 is City, Liverpool, Arsenal, Burnley, Chelsea and Fulham. The bottom 5 are Southampton, Manchester United, Tottenham, Cardiff and West Ham. Which team did you pick? I'm into March and Liverpool, Arsenal and Man City are all tied on points in the top three, although City have a game in hand. Spurs are fourth, on an island all alone, then United are fifth. Huddersfield are sixth, mainly because they took Solanki and Fred (lol Mourinho), on loan. Bottom three are Cardiff, Palace and Fulham. Leicester just snuck out of the bottom three for the first time this season by beating Newcastle 4-0 thanks to two red cards and two own goals from the Geordies in a game that didn't look anything at all like Mike Ashley trying to make some money from match fixing. Palace just fired Hodgson and hired.... Fat Sam. Because it's like a macro on their Outlook or something. Honestly, that's almost terrifyingly accurate. I only won the home fixture 6-3. So I see what some people mean by saying that Counter-pressing may be a little OP. Even though my team was supposed to finish 4th, I was not expecting our current run of 6 straight wins, including a cup victory over Lokeren (3-2 in extra time!). It's almost November and we've built a 11-point lead at the top of the table, and I'm kind of terrified this is all going to come crashing down very soon. Also, my backup DM just threw a hissy fit about not getting enough playing time, despite the fact that the starter is averaging a 7.21. Pleasantly, even before the story went public, the rest of the locker room told him to shove it. I went and checked out that injury from the 10-0 thumping. Turns out we scored ten and broke that guy's ribs. I don't think "sorry" covers that. That's a nice touch. I've had my Captain do the "Get down Mr. President!" thing and throw himself on a couple moody players so far, but a whole locker room telling a player to shut up is fun.